As someone who is a dyed in the wool DIYer, I moved into a brand new house and made it fit my taste exactly by decorating it and furnishing it on my own, and frugally. Here's some tips from a reader on how you can do the same to your home. Whether you are a dyed-in-the-wool DIY’er or someone who hires professionals for home improvement projects, two things are for sure: 1. You have a laundry list of upgrades you want to make to your house, and 2. You did not just win the lottery. In other words, you are going to have to find ways to give your home that more expensive and upgraded look you desire without breaking the bank. Fortunately, it’s quite possible to do just that — check out the following four ideas. If you have watched house flipping shows on TV, you already know how much of an impact a stylish backsplash can make in the kitchen and bathroom. You’ve probably also caught the hosts mentioning the often high prices for this type of project. 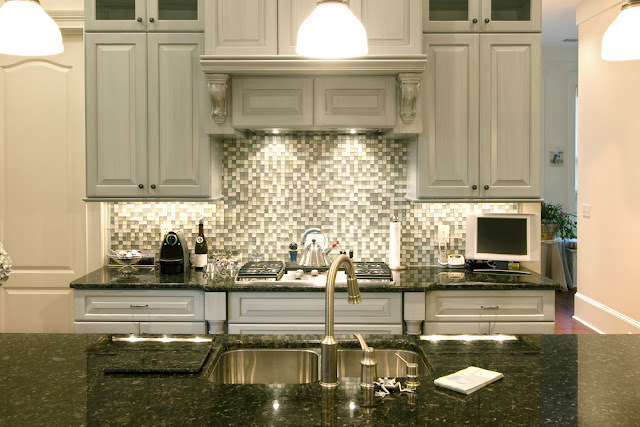 Fear not, by doing some smart shopping, you can find gorgeous backsplashes at bargain prices. For instance, the Gibson 12-inch by 13-inch Mixed Mosaic Tile in Zen Escape by Itona Tile features a rich mix of creams, tans and dark browns that would look great in any kitchen or bathroom — or both. You can buy them online and either install them yourself or pay a handyman to help you out. An old and dated fireplace can be given a modern makeover for the cost of a can of paint. Start by thoroughly cleaning the fireplace to loosen any dirt and grime, then add a stain-blocking primer before painting to cover any soot stains. Choose a high-gloss paint in a rich color to help it become a focal point for the living room. If you wish, you can also purchase large tiles to cover an old brick hearth and give the fireplace a more up-to-date look. If you love a good DIY project, you can’t go wrong with adding crown molding to your living room, dining room and any other rooms that you desire. When it comes to fancying up rooms and giving them a more luxurious look, this relatively simple project is like adding bling to the walls. As a bonus, it’s not typically an expensive endeavor, especially if you do it yourself. You can also hire a professional to install the crown molding that you have already selected — this way, you can shop around for sales, purchase the exact molding you want and then have the handyman handle the actual installation. Drive through ritzy neighborhoods at night and one thing is immediately apparent: most of the homes have amazing outdoor lighting that accentuates landscaping, trees, sidewalks and more. You can recreate this same look by adding outdoor lights to your pathways, beneath bushes, on the back patio, etc. A super inexpensive way to add ethereal lighting out back is with strings of patio lights that feature clear glass bulbs; Etsy sells a nice selection of this type of light, including the G40 String Lights that feature 25 Globe Lights per 25 foot strand. Hook them up from the patio cover to nearby trees and your backyard will shimmer with lights that look luxurious but cost less than $15 a strand. Someday, when you win that lottery, you can really go to town with the most expensive home improvement projects in the world. But for now, it’s good to know that you don’t need a ton of cash to transform your home on a proverbial dime into something that looks like it cost thousands.